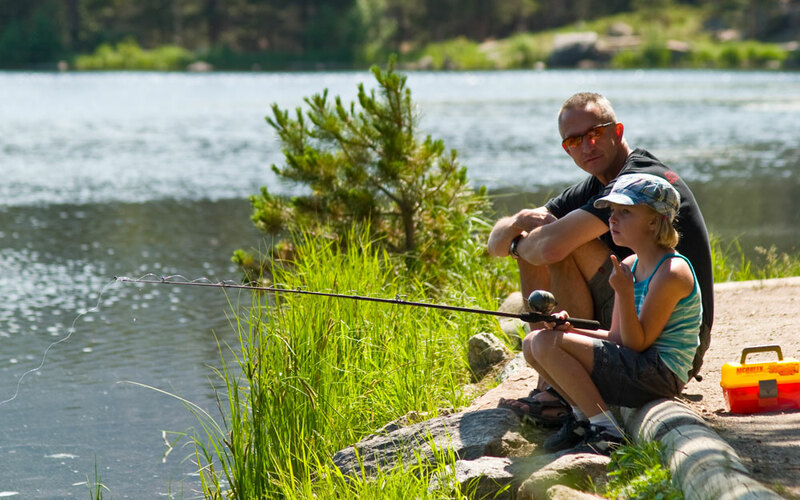 Load up your tackle box and picnic basket to create lasting family memories on a Colorado fishing adventure. You'll find easily accessible ponds, lakes and streams that make the perfect place to spend a sunny afternoon catching the state's famous rainbow trout. One of Manitou Springs' claims to fame is the mineral spring water that the town was built around, and this small pond is the perfect place for the whole family to sink a line into those famous waters. On the east side of town, the pond is fed by Fountain Creek and shaded by giant cottonwood trees. Each spring, the Colorado Division of Wildlife stocks it with catchable trout. Other activities include a community swimming pool and playground. Also known as Sheldon Lake, this pond is a lively urban fishing hole chock-full of rainbow trout, bluegill and crappies. Perch on the large wooden deck near plenty of picnic tables and drop your line in over the railing – it won't be long before you feel a tug on your pole. The evening is a popular time for family fishing, when a friendly spirit fills the park. Stick around for more activities, like City Park Pool, paddle boats, a miniature train, a huge playground, basketball courts and a pottery studio. One of the most fabulous destinations for reeling in the day's catch is just outside of town at Corn Lake. With both warm- and cold-water fishing, the lake is stocked with catchable-size rainbow trout and has self-sustaining populations of largemouth bass, crappie, bluegill and channel catfish. The site is ADA accessible and offers public restrooms and picnic tables, too. One mile to the west is the Colorado River Wildlife Area, which features hiking, wildlife observation and environmental education activities. Only a short jaunt from either Denver or Fort Collins, St. Vrain State Park offers more fishing ponds than anyone could visit in one trip. Sandpiper and Mallard ponds win best spots for families because of their accessibility from the parking lot, proximity to restrooms and heavy-handed stocking of rainbow trout, channel catfish, bass, perch, bluegill and saugeye. Keep your eyes peeled for other wildlife, like eagles and blue herons. While you're there, also check out easy hiking trials and new camping sites. In southern Colorado, Lake Pueblo State Park is a mecca for boating, but if you're there with the kids, the smaller Anticline Fishing Pond is not to be missed. The pier makes the ideal place to perch for an afternoon of hooking walleye, wiper and bass, as well as stocked trout. Only steps away are the swimming beach, playground, zoo, public restrooms and picnic tables. Of course, the kiddos will love fishing off a boat, too; rentals are available at either of the two marinas. Although we wouldn't compare it to shooting fish in a barrel, at Trout Haven Ranch everyone is guaranteed to catch something. Plus, you can have a the fun of fishing in the Rockies, without fussing over the details of purchasing a license, buying or renting equipment, or cleaning and freezing the fish once you've caught them – all that's taken care of. Book a night at the on-site cabins or lodge so you can take advantage of other Estes Park activities, like biking, hiking, rafting, horseback riding and more. Where the urban landscape of Denver gives way to the scenic foothills, this easy-to-find fishing hole awaits. The whole family will love hanging out on the piers to pull in trout, bass, bluegill and perch from the big, scenic lake. For more ideas on exploring Bear Creek Lake Park, head to the visitors center, where you can see wildlife exhibits, talk to park rangers and plan your trip. In the shadow of the majestic San Juan Mountains rests this humble little lake, which is perfect for kids because you can drive right up to it, there's ample casting room and the banks aren't steep. Plus, everyone will catch something because stocked trout, sunfish, bass and catfish thrive in its waters. Sneak a little education into your fishing trip by learning about Chief Ouray, his wife Chipeta and more American Indian history at the Ute Indian Museum that is located within the Chipeta Lake State Wildlife Area. One of the best things about fishing this alpine paradise is the unlimited variety. On the west side of the park, Lake Granby, Grand Lake and Shadow Lake provide commercial marinas and boating around some of the largest bodies of water in Colorado. On the east side, Lake Estes and Lake Marys are smaller and offer a more rustic and private outing. You can also add another level of adventure by scheduling a horseback ride that takes you to and from some more exotic fishing spots, or camp in the park and hit a bunch of different ones. Find great spots for Colorado fishing and fly-fishing, and learn more about Colorado lakes. For more fishing inspiration, check out our video of fly-fishers on the Roaring Fork River near Basalt.